The Willamette® K-R99901 and Georgeson™ K-99911 widespread bathroom sink faucets use a quick disconnect tee for supply hose connection. Each hose that attaches to the tee contains two white snap connectors that interlock with the tee. The tee may leak if the snap connectors are not properly seated in the tee. Refer to the instructions below to properly connect and disconnect the supply hoses to the tee. Make sure the O-ring is seated onto the end of the hose as shown. Press the white snap connectors in while inserting the end of the hose into the tee. 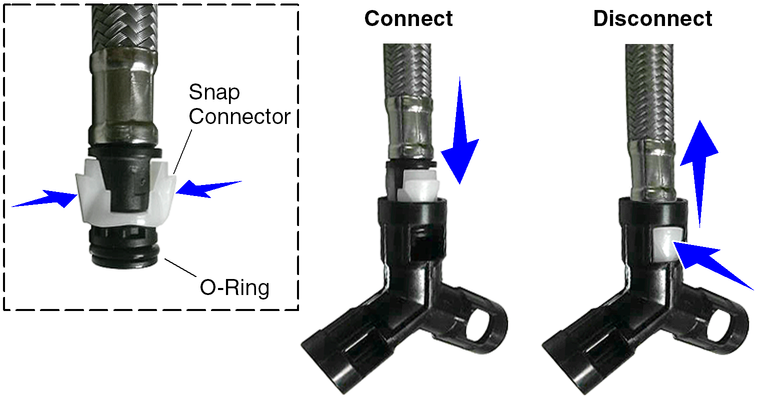 Push the hose and tee together until both snap connectors click into place. To detach the hose, press one side of the white snap connector in, and gently pull on the hose. The white snap connector will withdraw under the edge of the tee. Then press the opposite side snap connector to release the hose.